The one thing that really winds me up after spending time putting on a face of makeup is watching it all melt off. Whether it's due to oily skin or heat, it can make you feel a bit like a clown and down about your effort being wasted. Well, let's say no to any more of that. 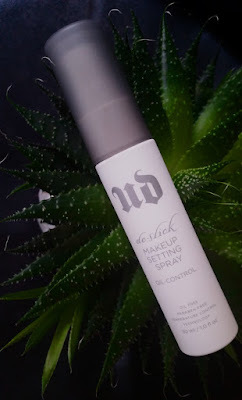 Urban Decay's De-Slick Makeup Setting Spray is one of a few different types of makeup setting sprays by the brand, but this one is primarily targeted towards oilier skin and those who melt in the heat (but of course it can be used by any skin type). It is oil and paraben free whilst boasting "temperature control technology". It is a lightweight mist that promises to leave the skin with a matte finish, sealing your cheek and eye makeup for hours. You'll barely need to touch up (if at all). Sounds good, no? Now whilst this isn't a new release, this is one that I have personally wanted to try and review for a long time. There was no real reason as to why I haven't done so before now, but let's go with "better late than never"! This spray comes in two sizes: the 30ml travel size and the 120ml full-size. It comes packaged in a white bottle with a spray pump that is covered by a clear plastic lid, which is then covered with a dark grey plastic lid. I assume this is to prevent leaks. I recently went to a wedding, so I figured that this would be the perfect opportunity to give this spray a whirl. Instead of picking up the normal, full-size version, I grabbed the travel size to fit in my bag (also better to try the trial version when you buy new products if they have them, just incase), so let's see how it fared! To use, first of all make sure you close your eyes (we're not de-slicking our eyes, ahh!). Next, you need to spray your freshly made up face in an 'x' shape, followed by a 'T' shape and let it dry. Because I used this for the wedding, I had myself a trial partner in my sister. I was recruited to do her makeup for the event, so she was up for also giving me her opinions on this spray at the end of the day. Her skin type is more normal-combination rather than oily, but she melts in the heat and is forever needing to dab her face with a tissue, so that's two different skin types to provide opinions. After spraying on De-Slick and allowing it to set, it got to work straight away. As I hit the time where I'd be starting to get a bit shiny, my skin still felt cool and shine free. My sister also said the same. She was thrilled that she wasn't having to blot her face continuously to remove excess shine from her skin caused by the heat (and it was a hot day). Over the day/night, I managed to get away with one small top up of powder. That's it. And that was towards the end of the night after drinking and dancing. I had to reapply my lipstick a few times thanks to food/drink, but the rest of my face looked fresh all day with no caking. This is a huge relief for somebody like me, you have no idea. My sister was also raving about De-Slick. She was even using it during the reception, showing it off in the bathroom and recommending it to the bride (not that she needed it, she looked flawless!). I tried my best to think of some cons about this product to try to make this review more balanced, but I'm genuinely struggling. I guess the only thing I can think of is that when my sister first got her hands on it she wasn't originally able to remove the cap. Because of that, she assumed it was a screw cap and unscrewed it (not that that would make any sense, being a "spray" and all, but there is always one), spilling a fair amount in the process. So there's that: the cap is a bit tight and takes a little bit of effort to remove when you first get it. Or that may just be this bottle. I can tell you all now that this is one of those products that will certainly be getting upgraded to the full-size version upon next purchase. This spray is the thing I've needed for so long, I should have bought it sooner. If you also suffer from oily skin that causes makeup meltdowns, you really, really need to try Urban Decay's De-Slick Makeup Setting Spray. By all means, do the same as me and splurge on the travel version first, but I can guarantee you'll be going for the big bottle as soon as it's done. You can purchase the Urban Decay De-Slick Makeup Spray from Feel Unique. 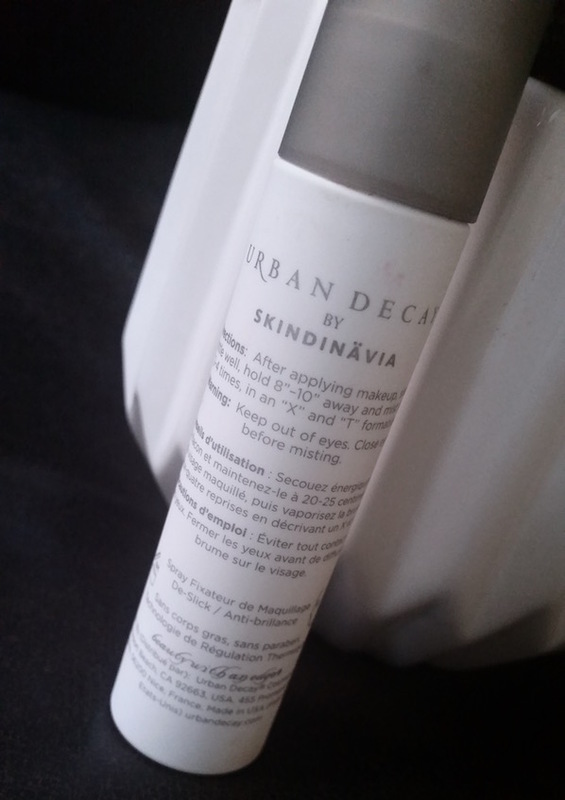 What are your thoughts on the Urban Decay De-Slick Makeup Spray? What's your favourite way to get your makeup to stay in place? I've heard many great things about this product. I find that some setting sprays, including this one, are not exactly inexpensive. But it sure looks like a great investment. Beautifinous will be back shortly! Is this the best way to remove makeup?